The company zaragozana has signed an agreement with the American franchise to design the project, supply systems and execute all the audiovisual equipment of this new location in the Valencian Community, adding to the seven that already has in Spain. The well known American restaurant chain Hard Rock Café He has completed works for its new premises in Valencia, the eighth in franchise in Spain, whose project design, supply and execution of all AV equipment has been made by the specialist Audiovisual architecturebased in Zaragoza, after overcoming the analysis made by those responsible in this area of Orlando, Florida headquarters. The new Hard Rock Café in Valencia is structured in two floors with basement (1,200 square meters of surface), housing a restaurant of typical American food, spaces for live music and the Rock Shop, the shop famous for selling merchandising unique to each city. All the chain stores are decorated with rock cult objects, such as guitars or musical instruments of famous bands and artists donate or purchase from private collections. 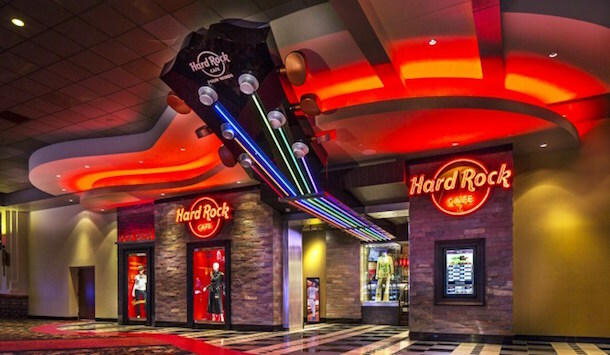 The technical project carried out by Audiovisual architecture is based on a complete solution of reproduction, transmission and management of audio and video, digitally processed and able to reproduce all the audiovisual contents to Hard Rock Café uses in its daily activity. For establishing sound equipment has been chosen for sound reinforcement equipment chosen for this establishment is the manufacturer's JBL, with amplification of Crown Audio and audio equipment with digital processing of BSS Soundweb, managing all content audio that should play in a personalized way both different parts of the local, and their scenes during live events. The Audiovisual Architecture Engineering Department has made a custom development of a control interface system using wireless touch screens, that allows you to manage the content that should be with total mobility and autonomy play in each local area and what conditions must be heard. Forty professional pmonitores distributed by two local plants, receiving video content in high definition are decided at all times from the servers of Hard Rock Cafe, have been installed in the display area as well as from local sources (cable TV, Blu Ray, HD cameras) to broadcast live events taking place on the premises. The entire process of distribution and management of video signals is via HDMI matrix of Kramer Electronicsthat they allow to select which signal you want to play in every one of the existing monitors. The distribution of all signals from video to all screens is made with HDBase-T, since it sends a signal Full HD-quality visual systems without loss of quality, even with long distances cabling.